Annie Chang – Jarman International K.K. Favorite Thing About Living in Japan: Dynamic and cosmopolitan working environment and a safe and convenient lifestyle. 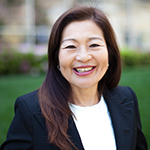 BIO: Annie came to Japan from Taiwan for adventure, survived in a male-dominated society and became an entrepreneur. She has established three companies focus on recruitment, career consulting and computer training. She met her husband in Tokyo and started a family with twin daughters. Annie travels all over Japan to enjoy the rich culture, onsen, food and chatting with local people. Domestic travel is helping Annie recharge her energy in her day to day busy life. Annie is also an Advocator on women Empowerment with a technology focus and founded the Women in Technology Japan group. Annie Chang was interviewed by the Japan Times on 1/28/2019 in the DIRECTORY OF WHO’S WHO IN THE WORLD OF BUSINESS IN JAPAN section.